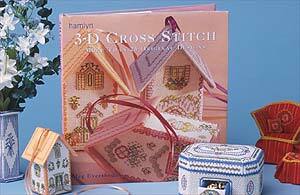 Written by Meg Evershed, the Nutmeg Company's designer, this book will tell you everything you need to know about the techniques used in three dimensional stitching. It contains twenty five projects, including money boxes, a clock and doll's house furniture, and provides charts and full instructions for making them. The book is now out of print, although it is sometimes available from second-hand book sellers. We have been able to obtain a few good quality second-hand copies ourselves which we would be pleased to supply, signed by Meg. If you would like a special dedication please say clearly what you want it to say in the special instructions part of the order form, or ring us to place the order. Supplies are very limited, but we wanted to make the book available again and hope this helps.